With synchronous updating, the primary appliance is updated first and maintains its role as primary. This method does involve some downtime; it is recommended for simple deployments and scenarios that will not suffer from being offline during the update. BeyondTrust recommends performing upgrades during scheduled maintenance windows. Your BeyondTrust site will be temporarily unavailable during the upgrade. All logged in users and active sessions will be terminated. You will need to schedule two separate maintenance windows in which to complete the upgrade. Installation usually takes between 15 minutes to an hour. However, if you are storing a large amount of data on your appliance (e.g., session recordings), the installation could take significantly longer. Plan an interim period between the two maintenance windows adequate enough to confirm the new software version in your production environment but brief enough to minimize the exposure of temporarily not having a failover configuration. BeyondTrust also recommends testing the update in a controlled environment prior to deploying into production. If you experience any issues during the Base update, do not restart the Secure Remote Access Appliance. Please contact BeyondTrust Technical Support. In these instructions, Appliance A is the primary appliance (i.e., the appliance to which the primary hostname resolves), while Appliance B is the backup appliance. Prior to upgrading, make a backup of your current BeyondTrust software settings. On Appliance A, go to /login > Management > Software Management. Click the Download Backup button, and save the backup file to a secure location. Go to /login > Management > Failover, click Sync Now, and wait for synchronization to complete. Once synchronization has finished, click Break Failover Relationships. Update Appliance A using either the automatic or the manual update method. In most cases, BeyondTrust customers can download and install updates with no assistance from BeyondTrust Technical Support. To see if an upgrade is available, go to /appliance > Updates. "BeyondTrust" software updates often depend on one or more "Base Software" updates. Install the available Base Software updates to enable the dependent BeyondTrust updates. Then download a backup and immediately install the BeyondTrust software updates before doing anything else, such as failing over or installing updates on another appliance. If automatic updates fail when expected to work, please review the Check for Updates troubleshooting FAQ at help.bomgar.com/SSC/Main.aspx?rurl=377. If you are unable to use automatic updates (e.g., if your appliance exists on a restricted network), you may perform manual updates. Go to /appliance > Updates. 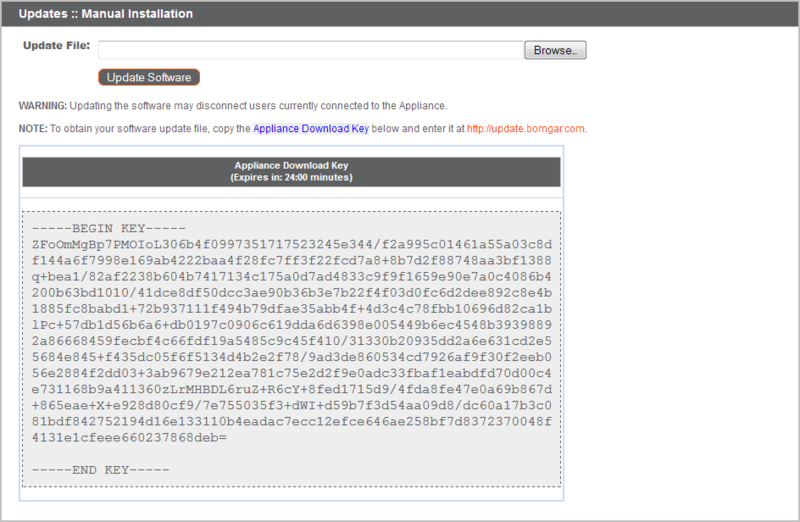 Starting with Base 3.3.2, click the Appliance Download Key link to generate a unique appliance key; prior to Base 3.3.2, you must contact BeyondTrust Technical Support to request this key. From a non-restricted system, submit this key to BeyondTrust's update server at https://update.bomgar.com. Download any available updates to a removable storage device and then transfer those updates to a system from which you can manage your appliance. From the Updates page, browse to the file from the Manual Installation section and then click the Update Software button to complete the installation. The appliance will install the new version of the BeyondTrust software. Be prepared to install software updates directly after download. Once an update has been downloaded, it no longer appears in your list of available updates. Should you need to re-download an update, contact BeyondTrust Technical Support. After completing the upgrade process, verify that the update completed successfully and that your software is working as expected. Your installed representative consoles will need to be upgraded after the site upgrades. Typically, this occurs automatically the next time the representative run the representative console.To check the software build that a console is running, log into the console and then click Help > About. Also be sure that you can make a connection to a remote computer via a session. Representative consoles previously deployed on locked-down computers using MSI may need to be re-deployed once the upgrade is complete. If the extractable representative console or extractable Jump Client feature has been enabled for your site by BeyondTrust Technical Support, then you can download an MSI installer to update representative consoles and/or Jump Clients prior to upgrading the appliance. To do this, check for the new update either manually or automatically. Click the Rep Console Installers or Jump Client Installers link to download the MSI for distribution. Note that the updated clients will not come online until their appliance is updated. It is not necessary to uninstall the original client prior to deploying the new one, as the new one should automatically replace the original installation. It is a best practice, however, to keep a copy of the old MSI to remove the outdated installations after the appliance is updated should this removal prove necessary. The new MSI is unable to do so. Update Appliance B using either the automatic or the manual update method as defined above. Then verify and test that the update completed successfully. From Appliance A, go to /login > Management > Failover. Reestablish the failover relationship with the backup appliance, using Appliance B as the backup and keeping Appliance A as the primary.